I think the price of gold will hold here. 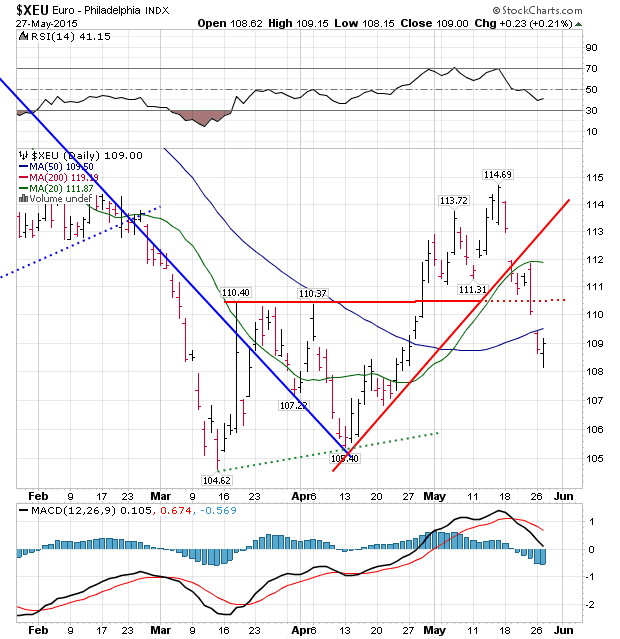 At least, until it breaks through $1,175 and silver $16.55. I have to stick with that. If I am wrong, they will trade down at least to the bottom triangle boundary ($1,150 and $16.00). Who knows? If they break that line they could fall further. Today the GOLD PRICE rose $2.50 to $1,188.10 and the SILVER PRICE rose 2.5 cents to $16.653. These piddling moves announce nothing, except the silver and gold price refusal to drop. (As I said above, using so lavishly many words). Today settled nothing, explained nothing. Stocks continue to roll over. Dow today lost 36.87 (0.2%) to 18,126.12 while the S&P shaved off 2.69 (0.13%) to 2,120.79. Stocks are acting more and more manic depressive, high one day, low the next, but without any net gain. Keep your eye on that net gain. When a car keeps spinning its wheels in the mud, eventually it mires down and sinks. The US dollar index rallied 10 months, from last July into this May, and a lot who rode that camel expected it to run forever. Didn’t. Dropped dead at 100.27 in May. Of course, that’s what investors and even sophisticated ones do, they project whatever trend runs currently out into the future forever, world without end. Dollar index dropped to 93.15 by Mid-May, forming a falling wedge on the way. Broke out of that upwards on 19 May, then surged straight up (not coincidentally, the fast move characteristic of a bear market rally when shorts get caught), rallied up to the 61.8% retracement level, 97.88, then stopped. Yesterday it fell back 3 basis points, today 32 to 97.15. If this were only a corrective rally in a longer downtrend, that’s how it would act. However, if it turns around and surges through 97.88, it will rise through the old high. My guess is that most of this dollar enthusiasm is being fueled by euro DIS-enthusiasm because of Greece. When that evaporates, the dollar will resume falling. I can’t be dogmatic about any of this, because the smoke still fills the air and I need confirmation. Okay, now y’all know everything I know. All these markets are waiting for something to break, something to erupt, to bust through their uneasy equilibrium. First, put yesterday into the rotten perspective it deserves. It was options expiry on Comex, the day when hundreds of GOLD PRICE and silver price options expire. With the GOLD PRICE above $1,200 and $1,190 and SILVER above $17.00, a bunch of call options were about to expire in the money and their writers were going to have to pony up — but NOT if the spot price dropped. So, it dropped, or was pushed. Happens nearly every month on options expiry day. Cheap chiseling. Markets are not benevolent. The GOLD PRICE today shaved off $1.30 to close Comex at $1,185.90. Silver gave back 9.6 cents to $16.638. With pessimists breathing down my neck like the arctic wind, I am trying to look at these charts realistically, but durn! Both silver and gold price broke out of even-sided triangles, traded up through their 200 DMAs, made highs higher than previous highs, and then dropped back to the upper boundary of the triangle. Friends, that ain’t deadly. Sure, if they break through that boundary they’d look puking sick, but not till then. 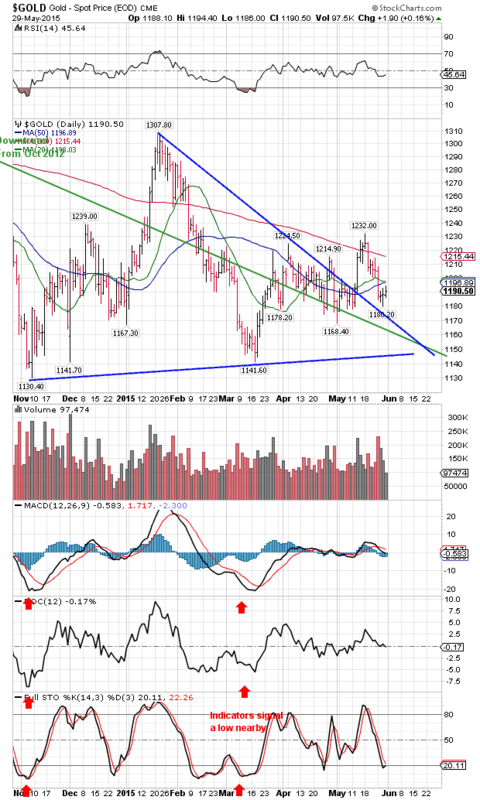 I don’t fancy the GOLD/SILVER RATIO climbing as it is, but that’s to be expected in a correction. More than that, the ratio punched through the 200 DMA yesterday, but closed way below it, and doesn’t even stand above its 20 DMA today. 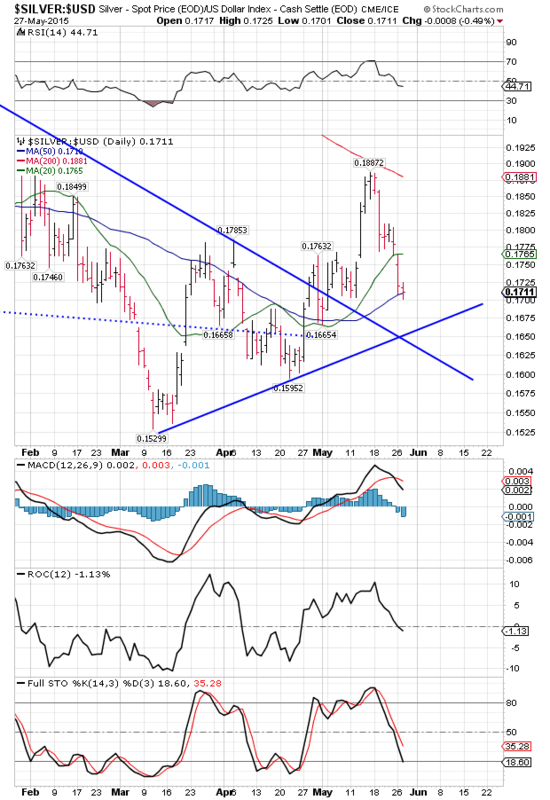 Silver/US Dollar Index Spread looks even stronger, However, it has reached its 50 DMA and must turn around here. Chart on left. Mind also we are moving into the time (June-July) when silver and gold prices show a seasonal low, usually with a strong upmove out of July & into August and later. That does not bode well for metals. I have to say it: even putting the worst gloss possible, I don’t see any massive drop from here, so I’m going to pull on a turtleneck to keep off the arctic breeze and stay with it: buy silver at $16.55 or gold at $1,175. I caution y’all, if I’m wrong the gold price can fall to $1,155 7 silver to $16.00, maybe lower. Yesterday on fears of Greece defaulting and an anti-austerity government being elected in Spain over the weekend and who knows what else, the US dollar index jumped up 129 basis points (1.35%) to 97.4, a colossal move. That took the dollar intraday to a perfect 61.8% retracement of its April – May fall, and through resistance at 96.50. Also rose past the 50 DMA, a prime target for corrections. Today the US Dollar index fell back 3 basis points to 97.38. Now the big question becomes, Is the dollar’s big rise over or will it keep on rising past the April high at 100.27. And the answer is . . . I haven’t a clue. Next day or so will tell as the dollar index will either stall at this level or blow on past it. 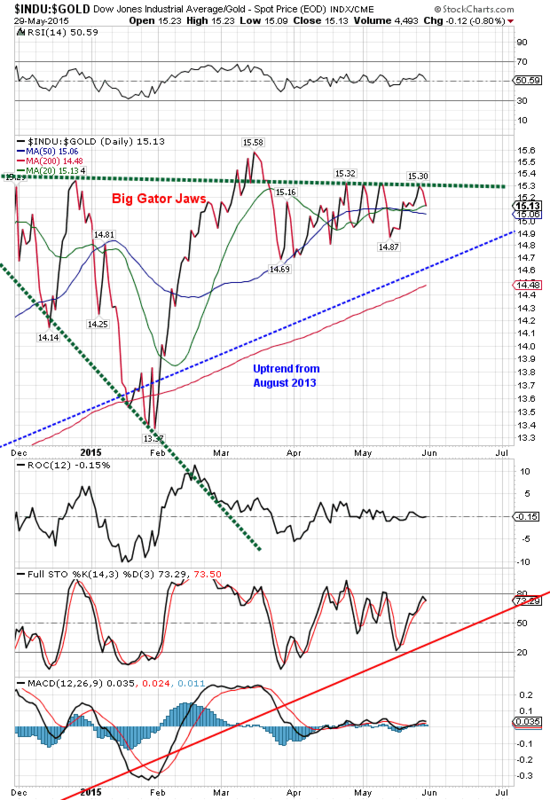 Clearly, a strongly rising dollar won’t help silver & gold prices. Now was the dollar’s surge helpful to the euro, shabby, pretentious fiat currency of the continent. Ont the chart on the right Y’all can see a breakaway gap down between $1.1130 and $1.1120, and another yesterday between $1.1000 and $1.0950. That second looks like an exhaustion gap, & if it is ’twill mark the extent of the move. 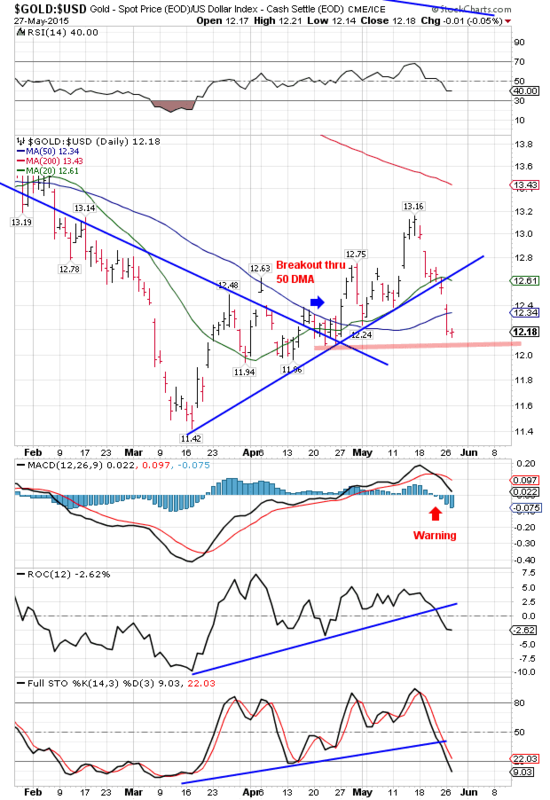 However, it left the euro below its 50 day moving average and 20 DMA, which leaves momentum down. Of course, that needs to be confirmed. Yesterday’s drop hurt the yen’s feelings the most. It dropped clean through the bottom of the 6 month trading channel (82.25) with a giant gap, so it has further to go. Closed today at 80.84, down 0.48%. Stinker. 10 year bond yield closed below it s200 DMA for the second time today. 30 year bond yield is hovering above its 200 DMA. Both appear to have pointed their noses earthward. The inflation markets copper & WTIC are disagreeing. 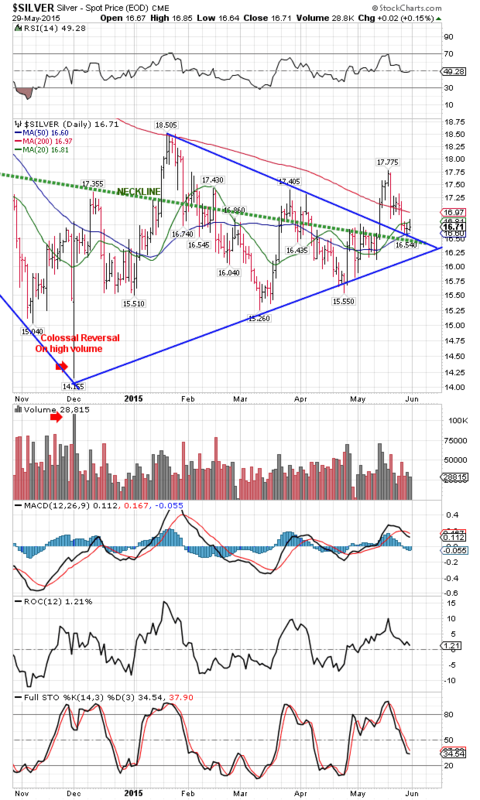 WTIC walked through its uptrend line, even in the last two days closed below its 20 DMA, but hasn’t fallen sharply. Today lost 1.44% to $57.51/barrel. Copper, on the other hand, sank through its 200 DMA 6 days ago and has made a stout business of falling ever since. Lost 0.31% today to end at $2.77. Dow gained back 121.45 of the 190.48 it lost yesterday to close at 18,162.99. S&P500 won back 19.28 of the 21.80 it lost Tuesday and ended at 2,123.48. Yesterday both the Dow & S&P500 fell out of rising wedges building for nearly 2 months. That took them below their 20 DMAs then today whipsawed them back above, but it still looks like a breakdown. Remember that Dow Theory requires that the Transports confirm the Industrials. Dow transports broke yesterday below its trading range. Utilities are sick. Dow Jones Composite average which adds up all three has traded slightly lower sideways sine end-December. 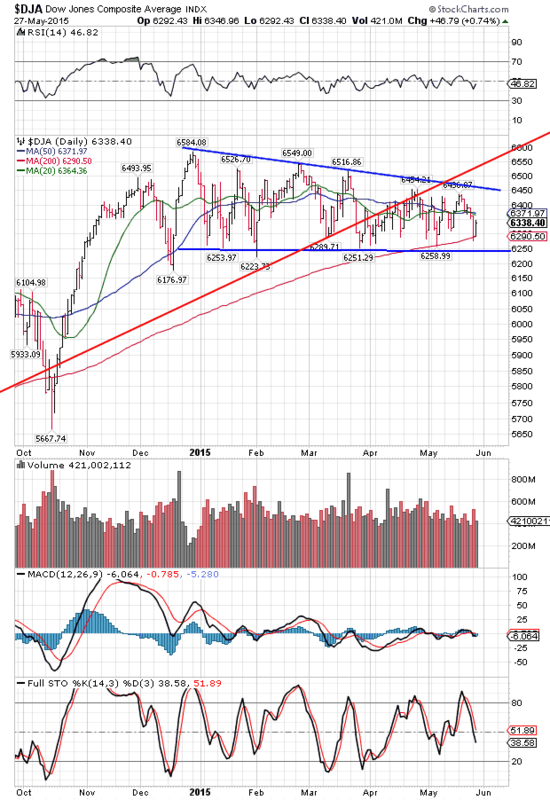 It has already walked through its uptrend line from the 2009 low. These are not positive developments if you wear pointy toed patent leather shoes & work on Wall Street. 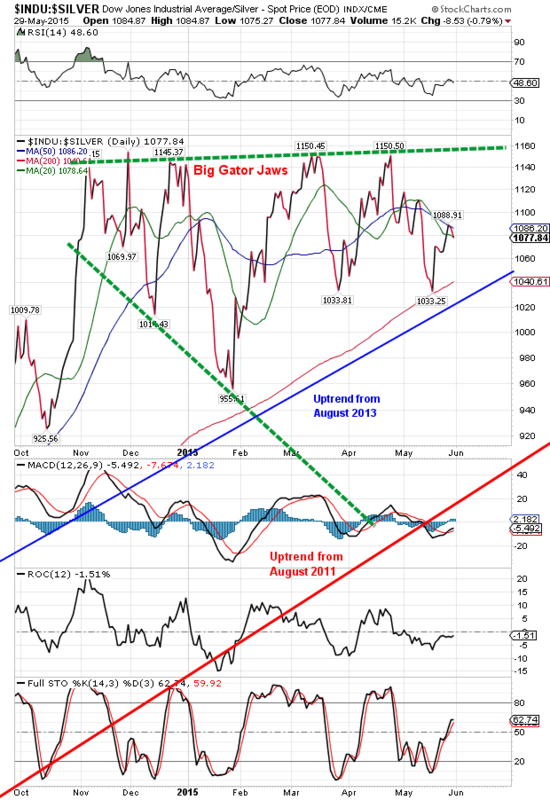 Dow in gold again touched the upper gator jaw today, closing at 15.32 oz. Dow in Silver is still halfway between the top gator jaw and its 200 DMA. All this still points to higher silver & gold prices and lower stocks.